Be sure to thank everyone who volunteered time to put the program together. A church anniversary program is a cause for celebration. No doubt the church has seen and experienced many changes over the years. Pastors come and go. Membership grows. 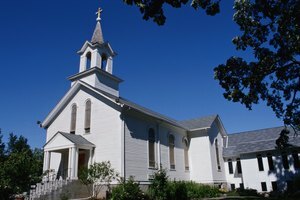 The church building itself even goes through changes in terms of size, location and exterior and interior remodeling and makeovers. 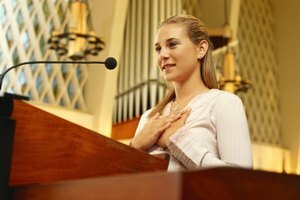 Use the history of the church to give your welcome speech relevancy and texture. Write about the good as well as the challenging times the church and its members have faced and triumphantly overcome to craft an engaging speech the entire audience will enjoy. Start by writing a basic outline for the speech. Include an introduction, body, and closing. Use the outline as a guide to make sure the speech flows from each section. Write your general welcome to members and guests in the introduction. Honor protocol and etiquette by welcoming guests on behalf of the pastor, his wife (by name), and members of the church. State the theme for the anniversary, if there is one. Include a bit of background about the theme. Highlight any activities the church is conducting in conjunction, such as helping the homeless, starting a school or community outreach efforts. Write the body of the speech. 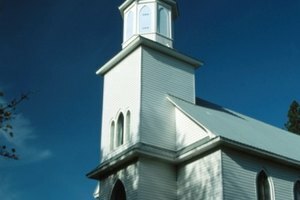 Write a brief history of the church, including the date the church was founded and the name of the pastor. Give the audience a historical reference such as the name of the United States President at the time, the population of the city, or inventions that didn’t exist like the television or computers, and hit songs and dances of the era. 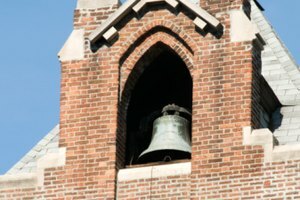 Include a funny story about the history of the church, such as faulty equipment, surviving snowstorms or non-working utilities. Interview the pastor and elder members for church trivia. Write about how the church has grown in terms of membership and activities over the years. Incorporate relevant scriptures that tie into how faith has helped the church to grow and survive challenges. Invite guests to come back and attend a regular church service. Write words that describe why your church is special and what they will gain by worshiping at your church. State the days of worship and hours of services. End your written speech by thanking guests again for attending, and close by introducing the next speaker, or returning the podium to the master or mistress of ceremonies, whichever applies. Rehearse your speech by reading it aloud to one or two friends or family members. Use their feedback to make revisions where needed. Take advantage of your church’s audio and visual equipment. Make side notes where you can show slides with pictures of pastors over the years. Use pictures to show church growth, such as new buildings, annexes and locations. 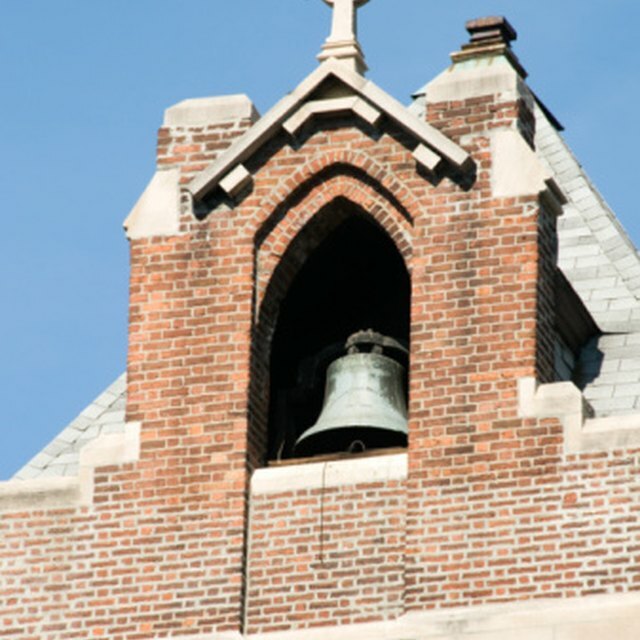 If you can write poetry, consider writing a poem about the history of the church. Make eye contact with the audience and smile often when you actually deliver the speech. Be sure to get the correct spelling and pronunciation for anyone you have to mention by name to avoid errors and embarrassment. Keep the tone light and add humor so guests and members will pay attention and stay engaged. Mrs. Irene Goggans; Milwaukee, Wisconsin; telephone interview, March 30, 2011. Munson, Cheryl. 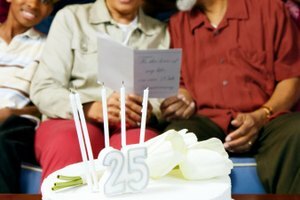 "How to Write a Welcome for a Church Anniversary Program." 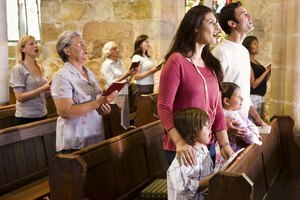 Synonym, https://classroom.synonym.com/how-to-write-a-welcome-for-a-church-anniversary-program-12082890.html. 29 September 2017.